Home » Library » Choice: harness or collar? Taking your puppy for his first walks is exciting! 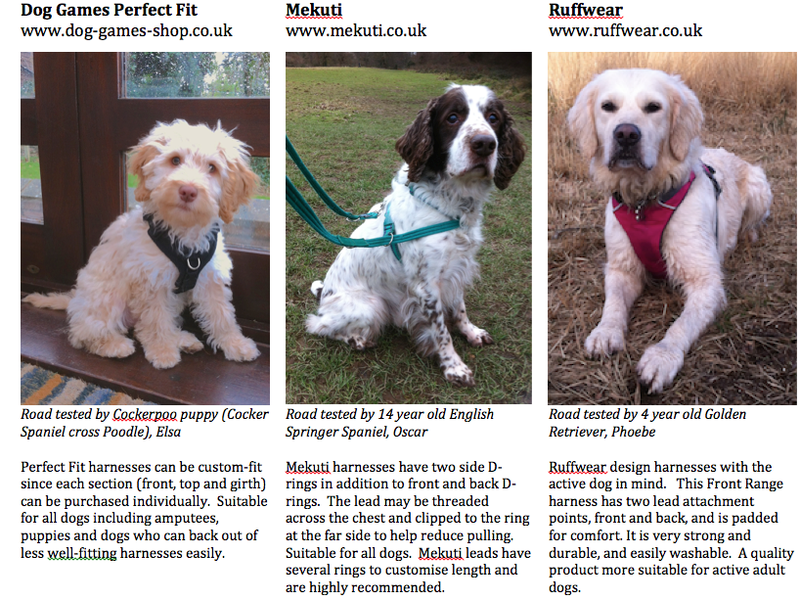 Have you considered the benefits of using a harness rather than a traditional collar and lead? Canine neck structure is similar to ours and a dog that pulls on his lead may damage the trachea (wind pipe), cause thyroid gland disorders or cervical spine problems. Pulling may even result in eye complaints. Using a flexi-lead with a collar may also be hazardous since a dog can suffer a whip-lash type injury if the lead reaches full length and jerks him backwards. You may wonder why, if pulling is potentially harmful and painful, dogs continue to pull. Simply because it works. Pulling gets them to the park! Because dogs have a higher pain threshold than humans they can continue to pull even when gasping for breath. A harness fits around the shoulders and chest, reducing the risk of neck injury. It often lessens pulling as the dog feels more comfortable, secure and balanced. A harness also gives you more control and an older, frail or ill dog may appreciate the additional support and guidance of a harness when out walking. How do you teach a wriggling puppy to quickly accept wearing a harness? Place your hand through the head hole of the harness. Holding a piece of food (with fingers pinched together) in front of your puppy’s nose, lure his head through the hole by slowly withdrawing your hand backwards. Feed him with an open hand when his head is through. Do not place the harness over your puppy’s head since this often causes backing away – you are teaching him the skill of placing his head through the harness. Next, drop a few morsels on the floor and whilst he is distracted eating, fasten the side clips. Fade the food when your puppy places his head through the harness of his own accord. If you have an adult dog, he will benefit from a good-fitting harness, too. Teach him to accept it in the same way as you would a puppy. Now your dog is kitted out, we need to teach him loose lead walking… so see you next month!